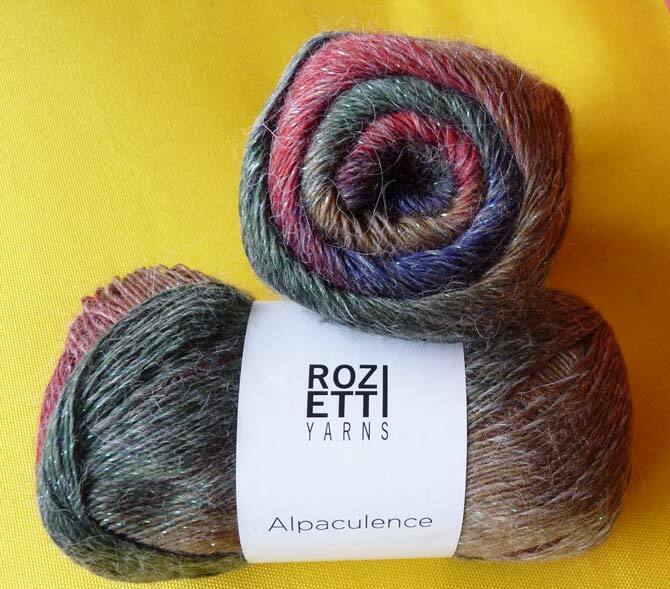 We’re sampling and playing with Alpaculence by Rozetti Yarns this week. If you’ve been reading along, you’ll know that this yarn has made me think about what it wants to be when it grows up. Today, we’re going to look at patterns that will showcase this blend of acrylic, wool, alpaca and glitter. The agate colorway in Alpaculence has a super, casual look that would look great with blue or black jeans. At least in my hands, the yarn skews when I knit stockinette stitch, but it straightens up when I use a knit-purl combination stitch pattern or garter stitch. Alpaculence is a singles yarn, and while you could knit socks with it, it would be well suited to soft garments like scarves, cowls shawls, and vests. We are testing yarn from a pre-production run. The final product will skew very little, if at all, compared to my results. This was made in Poems sock yarn and it will look FANtastic in Alpaculence! Seriously, when I saw the lace edge garter stitch shawl pattern, it went straight to the top of my list. Garter stitch, check. Comfort, check. Looks, check! This is a gorgeous pattern, and when you consider the 6% glitter in Alpaculence along with the halo resulting from the 9% alpaca content, this pattern will be stunning. Alpaculence and Poems Sock have different composition, but patterns for the latter suit Alpaculence very well. A close second is the Stained Glass shawl (above). It, too, was written for Poems Sock yarn, and it would look equally great in Alpaculence. Co-zy! 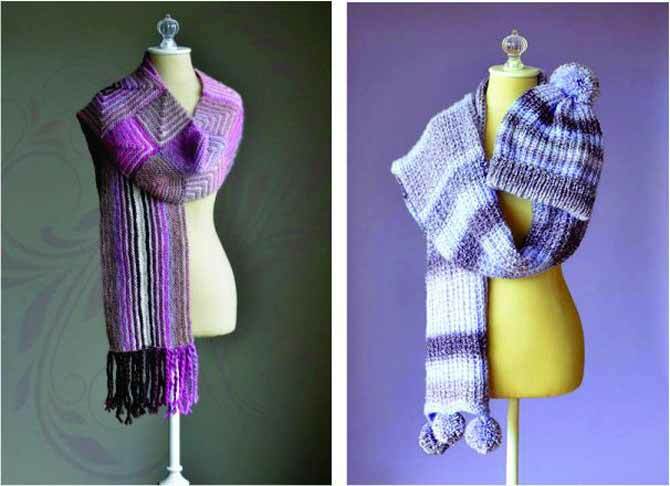 Be prepared for hours and hours of garter stitch knitting with either of these shawls! 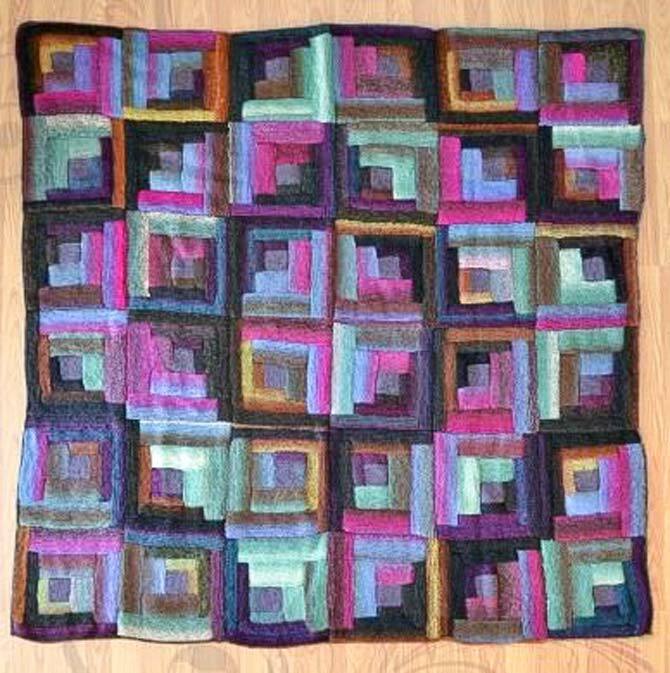 If a lot of knitting is your thing, you could make the Lively Log Cabin blanket. The pattern is written for Aran weight yarn on size 8 [5mm] needles, but by using Alpaculence and size 6 [4mm] or even size 5 [3.75mm] needles, the resulting smaller squares would be viable. You’d just have to knit more of them! The benefit of this is that the more log cabin squares you have, the more arrangements you can create. My recommended colorways for such a blanket would be Jade Blush and Aquamarine. The Lively Log Cabin blanket, knitted in an Aran weight yarn. 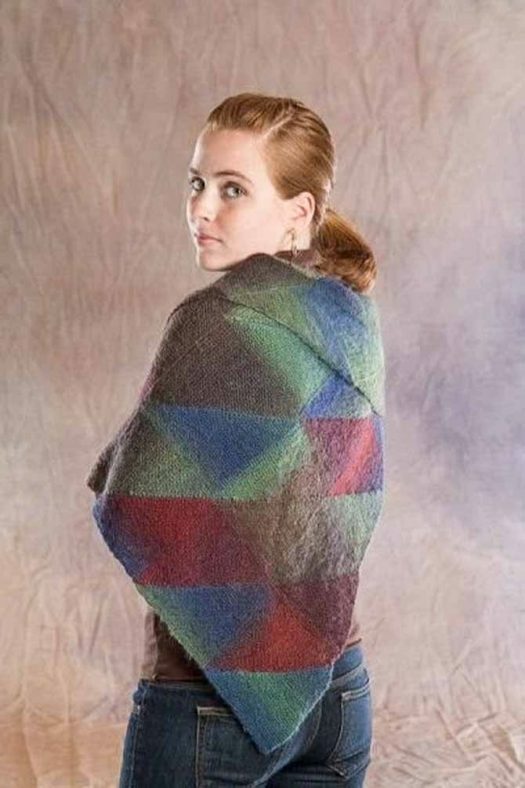 Another viable option would be Flying V, a triangular shawl knit from the top down. This pattern is written for a double knitting (DK) yarn, but it also uses size 5 [3.75mm] needles. 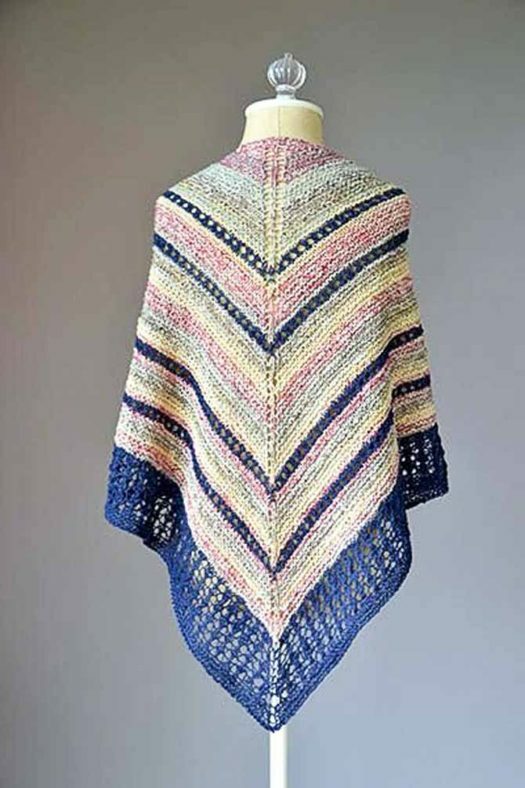 In my experience, sock yarn works up quite nicely into a shawl with that size needle, and, because it’s made from the top down, you could compensate by adding extra rows if the shawl is coming up a little short. I’d also recommend working the “resting rows” in the lace section as knit, instead of purl. My only concern with this pattern would be getting the lace edge to block out the way I’d want. I might be tempted to add beads to the bottom two ridges of garter stitch. 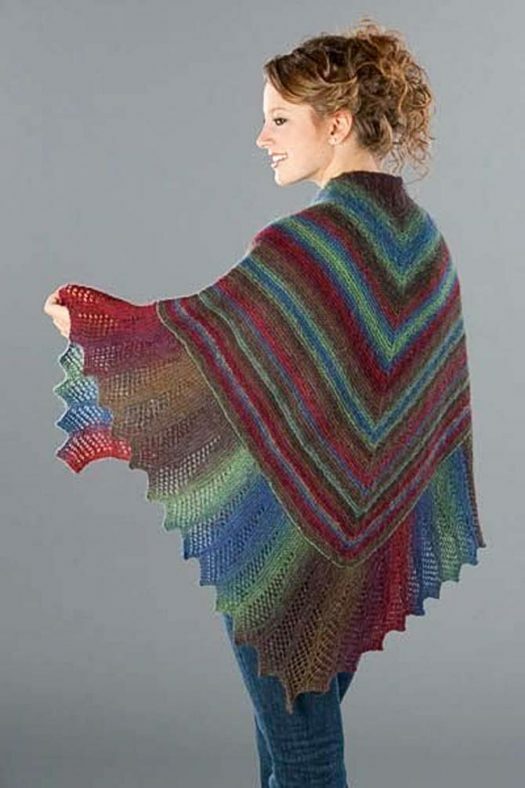 The Flying V shawl could be worked in one color of Alpaculence throughout. My last free pattern pick is the Seafoam scarf. It’s written for a worsted weight yarn, but the multiple of stitches for the pattern is given, so it could easily be worked in Alpaculence by using size 6 or 5 [4 or 3.75mm] needles and casting on 51 stitches. I think the undulating garter stitch would look great. The Seafoam scarf has a garters stitch ground and also some long-stitch textural interest. There are two other scarf patterns I thought would be great made with Alpaculence, both of which would have to be modified for this thinner yarn. The Mixed Miters scarf is a for-purchase pattern, and the Pomtastic Hat and Scarf set has a great knit-purl pattern. Mixed Miters Scarf is a for-purchase pattern, and the Pomtastic Hat and Scarf set has a great textured pattern. Both could be adapted for Alpaculence. I did try and find some funky patterns for all you sock knitters, but most of the ones on the Universal Yarn website were stockinette stitch. Since my stockinette stitch tends to spiral, I’m going to leave you to look for some patterns that have all-over ribbing or some cool knit-purl designs. Of course, you needn’t limit yourself to just free patterns from the manufacturer’s website — you could delve into your knitting library, and spend some quality time with a cup of tea browsing. If you have access to a pattern database, you could find hundreds of free or for-purchase patterns that would look great worked up in Alpaculence. While my sampling has had its ups and downs this week, there are a lot of pros and a few cons when working with singles yarn and yarn that has long spans of color. I’ll wrap up this week tomorrow with a discussion about that.